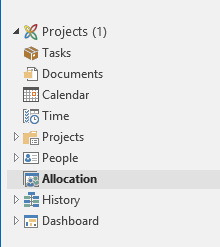 Open Outlook and navigate to InLoox by clicking on Projects in the navigation bar and then select Allocation in the folder panel. 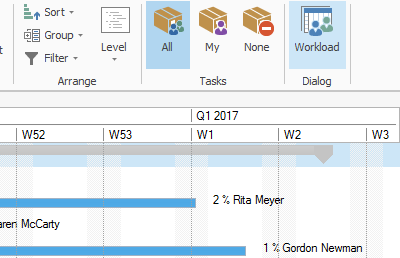 You can also open the allocation overview by clicking on the InLoox tab in Outlook and then selecting Workload in the ribbon. You can also find the resources and allocation overview inside individual projects. 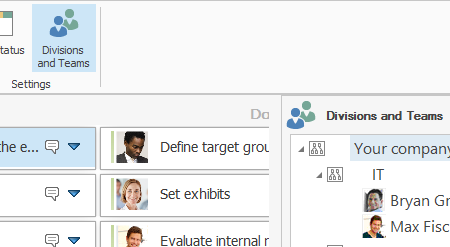 There you can display and manage the workload of the project team. You can display the workload overview in the Kanban view as well as the planning. 1. Navigate to your projects InLoox >> Projects and open a project from the project list. 2. Click on Tasks in the Start tab of the InLoox project window. 3. To show the departments and teams side panel, click on Divisions and Teams in the Edit tab. 4. 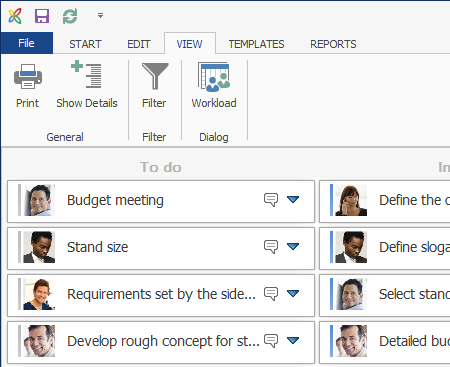 To open the workload overview of your project team, go to the View tab and click on Workload. The workload overview opens in a new window. Tip You can change the color scheme of the workload view in the planning in the InLoox Options. 4. You can display the workload in all projects (All Projects) or only the workload of the project that is currently open (Only this Project). 5. To display the workload, drag-and-drop one or more divisions and teams into the resource overview. If you want to hide the workload of a specific group, just drag-and-drop the group back into the side panel. You can also see the capacity of resources next to each task in the planning, provided you have allocated a resource to the task. 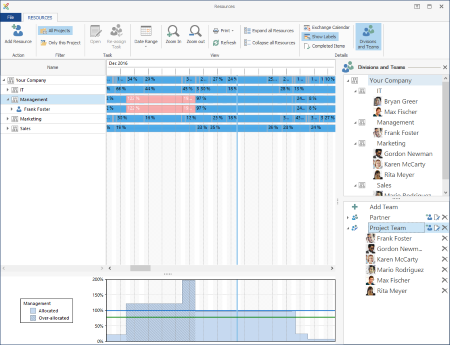 This enables you to see who in the project team still has capacities and who is over-allocated. In the latter cases, it is advisable to re-assign tasks to relieve a resource. Tip Project teams should never work to capacity (100%), because in most cases they do not work exclusively on the project. Usually, they also have to handle their daily workload. This means that when they are working to capacity in a project, they are actually over-allocated because you have to add 20% or 40% workload for daily tasks to the 100% project workload. Open the resources and workload allocation overview - InLoox • Copyright 1999-2019 © InLoox, Inc. All rights reserved.